15 minutes play...BumbleBeans Inc.: Amish Mini Finished! Wow, I actually finished one of these challenges before the deadline! Let's hear it for minis! I left the scrappy bars unquilted, after trying a line of stitching and ripping that out, too. Wasn't sure I'd like the dark blue border, but now that it's done, I do.This makes 2 minis in my collection. I think it would be fun to have an entire wall of them in my office (it won't take many, there's not much wall space in here to fill). 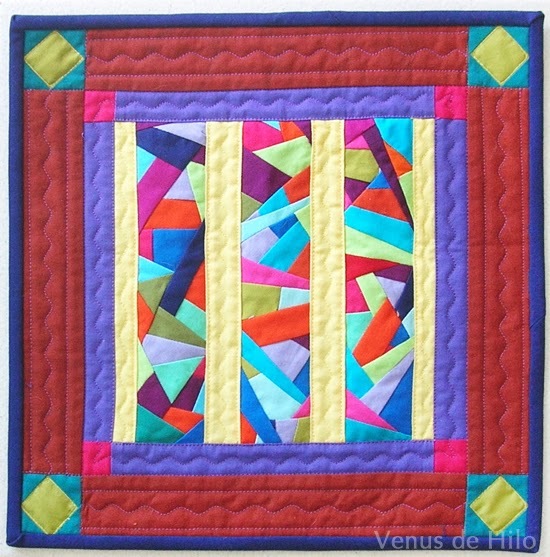 Very pretty block, Victoria, love the quilting ... 'Oooo, that's nice," says DH looking over my shoulder! Love that serpentine quilting. It has become my favorite machine stitch! It really suits the size of this mini, too.